Monique Griffith Designs: New Layouts: "Go Wild" and "The Simple Life"
New Layouts: "Go Wild" and "The Simple Life"
Nifty New "Cruisin" Layout & Blog Candy! Guess what! We have TWO new layouts to share with you today, and they're both kits. Either of these new kits can be ordered from our Cricut Kits page, which can accept PayPal or Google checkout. There's also the option to order just the directions, and then you can automatically download them. If you'd rather pay by check, just email me your order at moniquegriffith@yahoo.com and let me know your state or zip code. 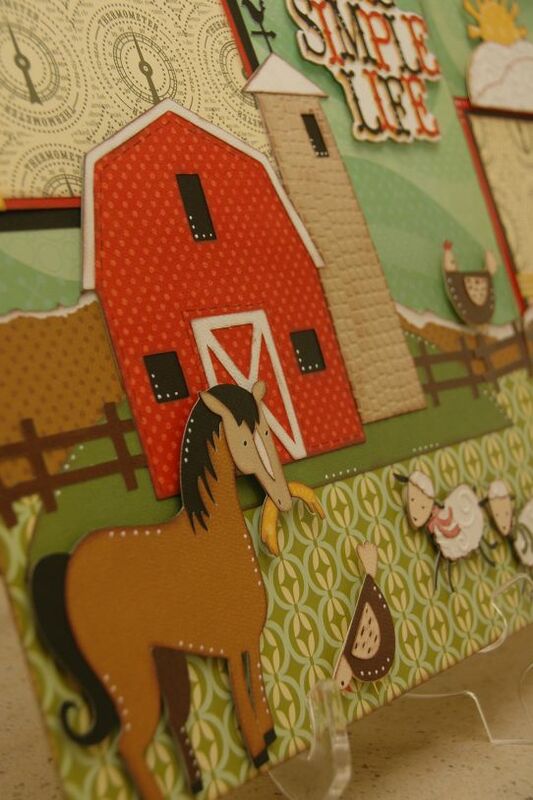 Included with this kit will be all of the patterned papers, cardstock and ribbon needed to complete the layout. You'll also get our detailed directions with Cricut Cut Chart that shows you line by line exactly what to cut on your machine, with all of the settings. The directions also include well-organized written instructions and several color photographs. To complete this project as shown, you'll need a Cricut Expression and mat, Create-a-Critter cartridge, chalk inks in the following colors: dark brown, blue, orange and purple, 3D pop dots, white gel pen, black pen, Diamond Stickles, plus basic tools and adhesive. 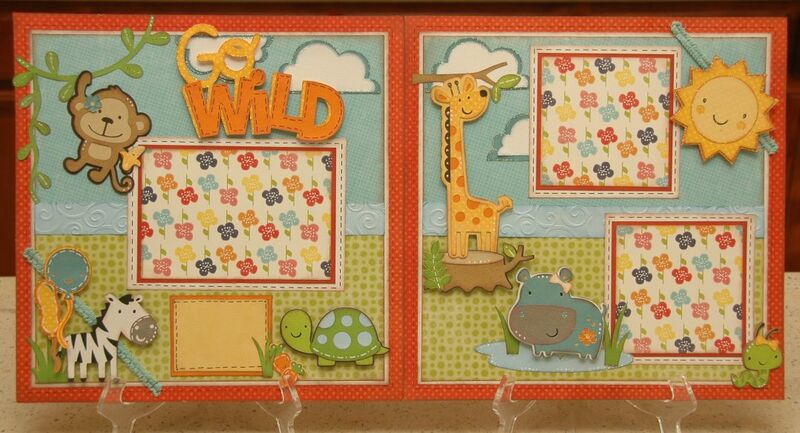 Cuttlebug and Divine Swirls embossing folder are optional. 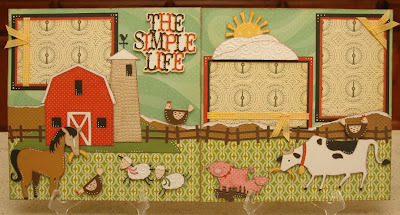 Next up is "The Simple Life" layout, designed by me (Monique). Wouldn't you love to just jump into this layout and live there for a week without a care in the world? Ok, unless that means getting up at 4:00am to milk the cows. As with our other kits, this one will include all of the papers, cardstock, and ribbon needed to complete the layout. And by the way, we also pre-cut some of the background strips and the photo mats for you. 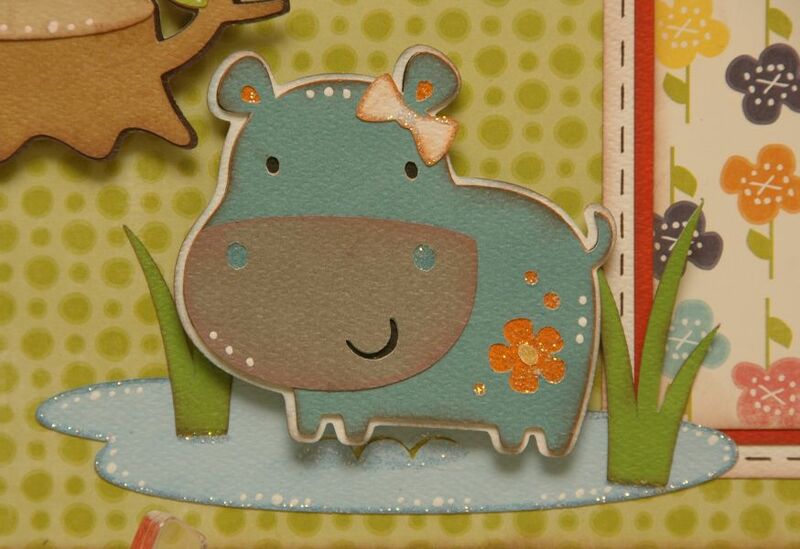 Of course, you'll also get full directions with cut chart and lots of color photographs. 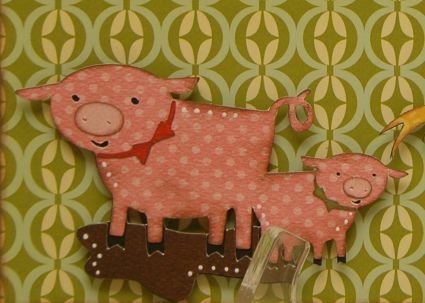 To complete this project as shown, you'll need the following: Cricut Expression and mat, Country Life cartridge, dark brown chalk ink, 3D pop dots, white gel pen, black pen, stapler, plus basic tools and adhesive. Cuttlebug and embossing folders (Divine Swirls and Tiny Mosaic) are optional but helpful. Either of these new kits can be ordered from our Cricut Kits page. The complete kits are each $25, which includes full directions. Or you can order just the directions for $10 and then download them automatically. Both kits are ready for shipping NOW. If you have any questions, just email me at moniquegriffith@yahoo.com. 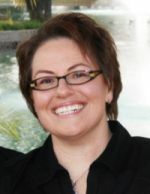 And finally, we have a winner for last week's blog candy! Please email me at moniquegriffith@yahoo.com with your shipping address, and I will send you the brand new "The Simple Life" kit (shown above). Congrats! Glad to see you guys posting again! :) Love the new layout! You are both so talented! Like mother, like daughter! :) Thanks for the chance to win as well. Take care! Loving both of those layouts!! You ladies do such wonderful work!! 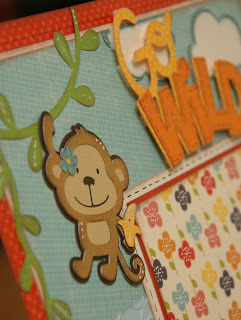 What a super cute lo from Becca!! Love it, love the critters! But I love, love the Simple Life since I live the simple life! LOL But just to set the record straight, I don't get up to milk the cows at 4am. LOL We have steers and not milk cows thank goodness!! I will be doing this lo for my farm pics that I take! Great job ladies and so good to see you lo's again!! Such beautiful layouts as always. I love all of the extra details you add to your layouts! WOW! I have missed you and your team! You inspire me beyond words. I really need The Simple Life Now!Im a teacher going back to work next week. Both layouts are awesome! These are both awesome! I wonder if I could borrow pictures of someone's cute kids at the farm? Might have to dress up the puppy in a bandana and improvise! I am sooo glad to see your new layouts. I have to have the for my grandson's pictures. Thanks for sharing your wonderful talent. These are gorgeous! I live in a rural area, but not on a ranch or farm...but I love that cart! And the zoo one is awesome. 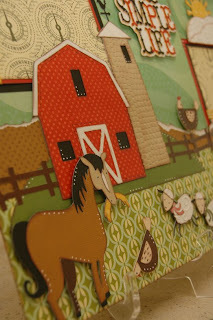 As I have never made a LO - The farm scene does intrigue me. This is the duo I want to make as a large card lol 12 x 12 for my hubby's 75th birthday card in September. He loves going to my sister & bil's farm esp during 4H projects. sooo glad to have you back posting......luv luv the paper you used on the simple life LO..
and I'm crazy over those cute critters on go wild...just luv all you ladies and how your minds work! Both new layouts are just adorable! Love both of these layouts especially the first one which relates more to my kids lol. You ladies are both such creative artist I often wonder what inspires your layouts. These layouts are very cute! I love them both. Your talent runs in the family. What great lay-outs! Thanks for offering the kits to jump start our creativity! Love both those layouts and I am SOOOOOOO HAPPY ya'll are back posting again. I dont have these carts but they do inspire me to try something else. You Rock thanks for sharing. So cute ladies! You never see to Amaze me! 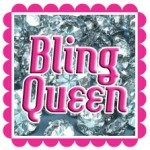 Monique, congrats on your training you are looking great! You are SO talented. I'm glad you are doing so well and back to creating! So glad you are back and feeling better balanced!! The bad news is going to be for my wallet!! I want 3 (so far) of the new LO's!! They are amazing, as always!